Where the heck is that thing?? The average American spends 40 minutes a day trying to find something that is misplaced. That’s almost 5 hours a week that could be better spent on other priorities. The top offenders in the “where is it?” category are wallet, car keys, purse and mobile phone. So, how do you create an organizing solution so that you never waste that time again? First, create a “home” for an item. My wallet, when not in my pocket, “lives” on my bedroom bureau. In the house, my purse hangs on a hook in the mudroom. I hang my car keys on the key rack in the mudroom when I enter the house. I carry my mobile phone in my pocket or in the house, it lives on the “charging shelf” in the kitchen. By creating a routine and a system, we have a go-to spot for our things, resulting in much less lost time searching for lost items. But what if I forgot to hang up my keys or my wallet fell out of my pocket, then what? Have you ever tried to walk out of the house only to find that your wallet or keys is not where they should be? Or misplace your cellphone in the house and you can’t call it because it’s dead or on silent? While I’m generally not a “product person”, I recently found a product that I recommend to everyone. 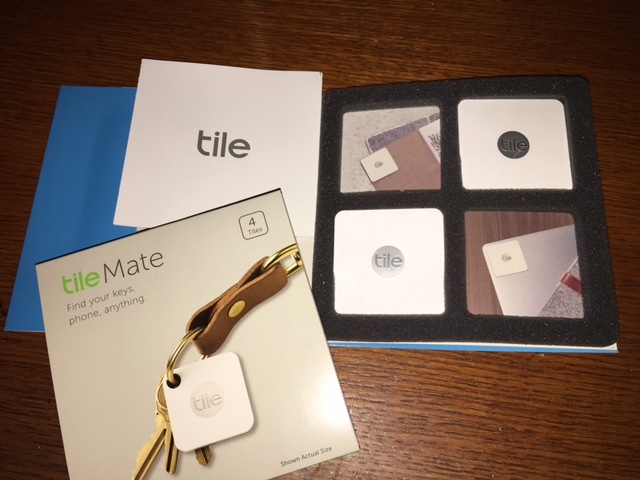 Tile is a small electronic piece that you can add to your keychain (the Tile Mate) and slip into a wallet, purse or adhere to many electronics (Tile Slim). Once you download the Tile app to your smart phone, you can “ring” the Tile to find the missing item. If the cellphone is the item you’ve misplaced, you can use a computer or any other Tile. Out of earshot? The Tile will show up on a map, showing you exactly where the item is. Losing keys or a wallet and scrambling around to find our missing items is stressful and time-consuming. Creating a “home” for your items is a great Plan A and Tile is a great Plan B+. Why is closet organization important? Who hasn’t struggled at one time or another with a closet that just won’t cooperate? Getting dressed and out the door is critical to a less stressful life – we do it at least once a day! So why does the closet remain such a struggle for many of us? If your goal is to become more organized overall and improve your time management, a great place to start is in your closet. Here are some closet organizing tips to get started. – Make sure you have proper lighting. 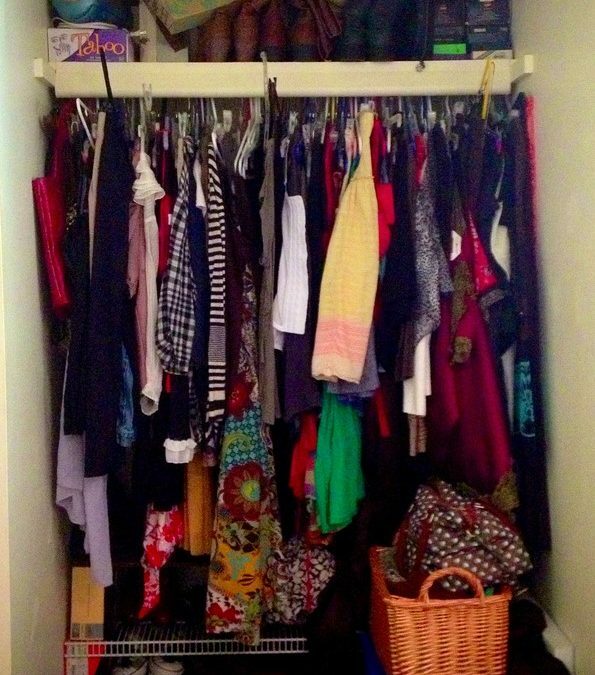 Can you see into the back corners of your closet where clothes are lurking? Battery operated lights will make seeing everything in your closet a snap. – Start from the bottom up and tackle everything that’s on the floor. In a rush, we tend to dump items on the floor figuring we’ll get to them later but instead they continue to pile up and we can’t find what we need when we need it. and make pulling out items difficult if they are caught up with empty hangers. And take your hangers on your next run to the dry cleaner – they will recycle and reuse them. How do I keep my closet organized? – Hang it up! Install metal butler hooks or removable command hooks for a multitude of items including hooded sweatshirts, belts, pajamas, accessories, etc and you’ve immediately found more room within your closet. – Purge, purge and purge some more! Pull out the stuff you really don’t love or don’t wear and donate or consign it. It does you no good sitting in your closet taking up valuable “real estate”. Closets can be challenging spaces. Clothes are much more than just things you wear – they are memories of special times and events and represent motivation and sometimes disappointment. Working with an organizing professional can help you break through your roadblocks and keep what you love and get rid of the rest…. What, exactly, is this charger for?? Have you ever picked up a cord or charger and thought “what the heck is this cord for?” The speed of technology has increased dramatically in just a few years. As a result, we’ve upgraded our tablets, computers and phones so many times that we are left with a jumble of cords and wires we can’t identify and are terrified to throw out “just in case”. So what’s a first good step to organizing your technology jumble? Start by labeling your current technology. Using a label maker or masking tape, create a label. Use simple names like “Lisa’s iPhone”, “Conor’s Kindle”, “Brett’s MAC” – you get the idea…Don’t be afraid to over tag – it’s better to have more tags than not. 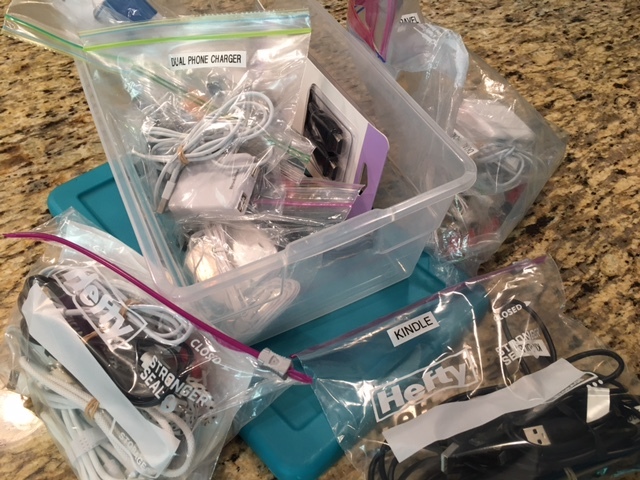 As an added step to managing and organizing your technology tangle, create a “technology box”. Store spare cables and plugs, extra headphones, a travel technology kit – whatever you need most frequently. And keep the box in one spot in the house or office. This will eliminate the hunt for an extra charging cord or new headphones when needed. Now, what about the mystery cords lurking in desks, drawers and baskets all over the house? Step one – gather all the cords, chargers, techno-stuff together. Be sure to check kids’ rooms too – technology will migrate there as your kids get older. Don’t forget all the learning and educational toys your child once used. The Leap Frogs, learning tablets and the like might not be in current use but are likely still hanging around and the cords might be separated from the device. Then one by one, try to figure out which device the cord goes with. Hint – check the battery plug. The plug will often have the manufacturer’s name on it. Do your best to figure out what goes with what but don’t obsess. If you haven’t missed it recently, it’s unlikely you’ll miss it in the future. DON’T throw those unneeded and mystery cords and chargers in the trash – techno trash is a real problem. 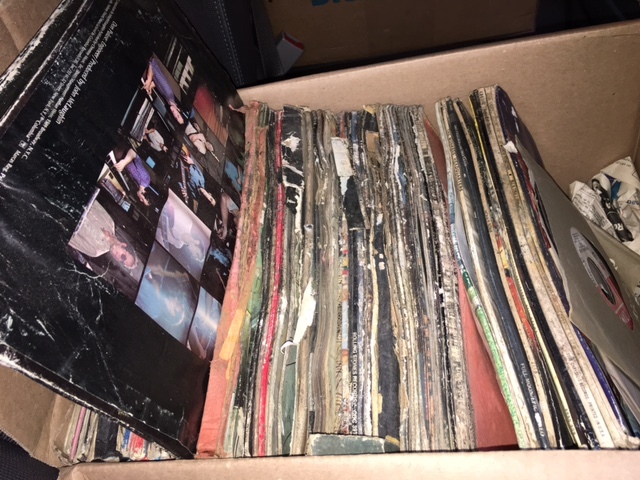 Take them to Best Buy or Staples and drop them off for proper recycling. Good storage is easy to use, easy to access and meets your price point. I recommend a variety of storage options based on the items you need to contain. Do you want to view your item and access it easily? One of the best options are clear, plastic bins with covers. These bins – think shoe box sized – are great containers for school supplies, arts & crafts, medicines and health and beauty items. Use these clear bins to corral small and loose items in any room including kitchen and bathroom. Do you struggle to keep your items organized in your cabinets and pantry? Use clear bins to contain like items and so finding your items is easier and this also make clean up quicker. Are you organizing and storing larger items like clothing, linens and holiday items? Extra large clear totes with locking covers are a good storage option. These totes are waterproof and are great in attics and basements and as a bonus, they are stackable thereby doubling your storage space. 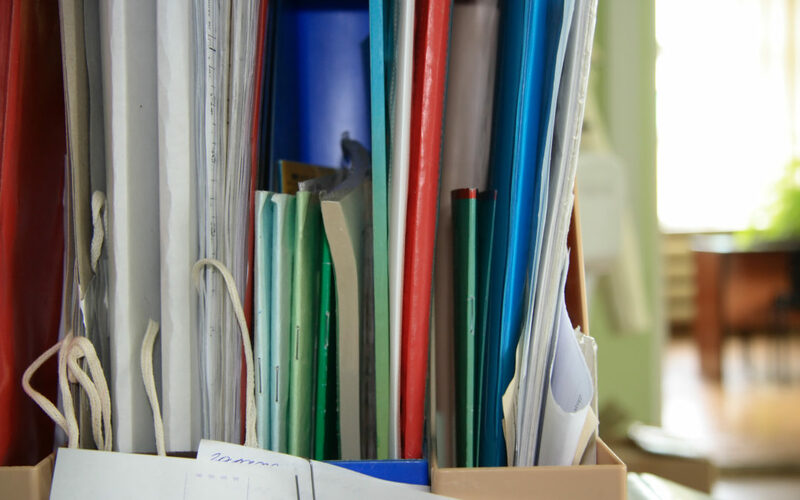 Is your office filing a mess? Invest in good quality pendaflex and folders to create an effective filing system. Nothing makes finding your documents more of a challenge than broken, ripped folders. When you are choosing a storage options, decide if you want the item to be viewable or hidden. Do you want to see the crayons and markers? Use a clear bin. Do you want to put books and toys in the family room? Use an opaque or fabric bin or basket to “hide” the items. Cardboard moving and banker’s boxes are NOT long term storage solutions. If you are moving and plan to store your items in these boxes for a short time, set a timeframe to find a more permanent solution. Humidity and water will break down these boxes quickly and make them structurally unsound and put your items at risk. Don’t let the elements make your decisions for you. Choose quality storage options to keep your items safe and organized. If you want to view your items quickly, opaque is not your friend. Do you have a new healthcare insurance provider? Did you make a switch on your auto or homeowner insurance recently? For most of us, making changes is common but updating our records and filing is not. Creating an effective filing system for your Working Documents is critical – see more on this topic here – but you also need to maintain and update that system. When working with clients, I urge them to cull old files and create new ones that meet present needs. Don’t rely on your memory to remember that your current auto policy is housed in a file with the name of the previous insurance company. Create a new, updated file. On average, you spend 40 minutes a day looking for something you cannot locate. What could you do with those 5+ hours a week? Take the two minutes NOW to create and update your file so that you don’t take 20 minutes the next time looking for a misfiled item. Now that you have updated your files, what other items need attention? What should I be updating? I recommend to clients that when new paperwork or updated items are received, immediately replace the old, outdated items. Insurance is a great example of this. Replace membership cards, policies, physical forms and other important documents as soon as you receive them. If you process your important paperwork immediately, there’s no searching for missing/current items. 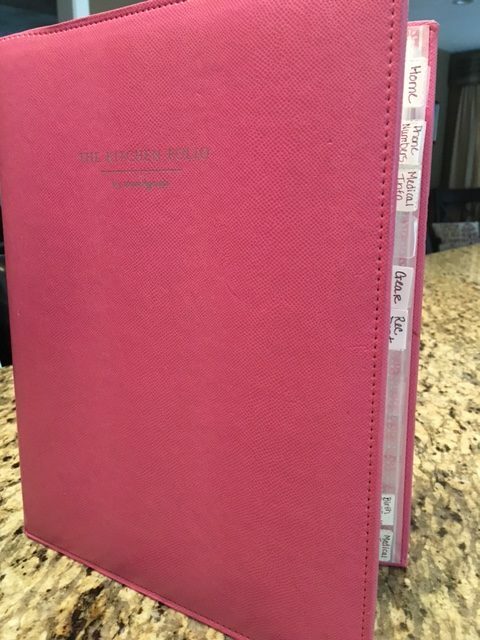 Do you keep a binder of your child’s current school information? Is your child heading to high school and you still have the 4th grade information in the book? Purge, purge, purge. Replace the old, outdated information with the new current content. Is your child a practiced driver and you still have the driver’s ed material on your counter? Throw it out. Review and update your files and information and only keep what is new and current. Also, I recommend a Kitchen Folio or binder with current content for every household. Put current physical forms and medication instructions, work and school information, new and updated phone numbers in a binder for easy access for the entire family.